After a devastating tragedy, Claire Banes sets out west as a mail-order bride for Edmund Parker, a General Goods owner in Laramie, Wyoming. On her arrival, she is dumbfounded by his rejection and his downright hostility towards her. What has she done to deserve such a welcoming? Heartbroken over the apparent mix-up she is ready to head back home on the next train. But his sister’s startling revelation and an unexpected visitor from his past bring her to a crossroads in her life of what is worth fighting for. Will Claire return home to Boston? Or will she muster the courage to fight for what was promised her? 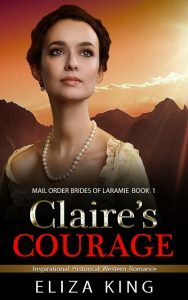 This book is part of the much-loved Mail Order Brides of Laramie Series. Each book is a stand-alone story but should be read in chronological order for the best reading experience as you meet your favorite characters again and again with each new book. Eliza King’s Clean Mail-Order Bride Historical Western Romance Series are enjoyed by all ages from Teen & Young Adult to a more mature audience.